Your car’s interior is hotter than outside air -- a lot hotter. Leaving a pet in the car is a very bad idea, but not illegal in over half of the U.S. The Humane Society of the United States describes how when it’s 72 degrees outside, the inside of your vehicle can heat up to 116 degrees within an hour. If it’s 80 degrees outside, your vehicle’s interior can reach 99 degrees within just 10 minutes. Rolling windows down has been shown to have little effect on the car’s interior temperature. Allowing a pet to get too cold can also cause harm. The ASPCA notes that cars can act as refrigerators and hold in the cold and cause animals to freeze to death. Hypothermia can become a risk at 50 degrees. Massachusetts law is the newest state to enact a law (effective Nov. 2016) protecting animals left in cars. Its law allows officers to cite an owner when conditions in a car are threatening the health of an animal due to extreme heat or cold. 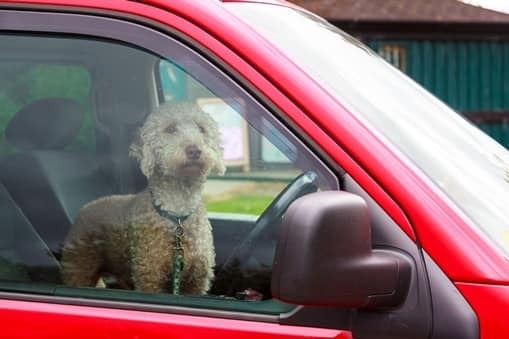 In a handful of states, (Florida, Ohio, Tennessee, Virginia and Wisconsin) the law doesn’t hand out an explicit penalty for leaving a pet in a car, but it does allow police officers and others, such as an animal control officer, to use reasonable steps to rescue the animal. These rescuers also have immunity from civil liability, which means, for instance, they can’t be held responsible for damage to the car. Penalties for leaving pets in cars vary significantly among states. For example, in Maryland the fine is $70, while in Rhode Island you may receive a fine of up to $1,000 or jail time of up to a year, or both. 0 Responses to "Leaving a pet in a vehicle"